An Iranian exile group, backed by international politicians, said on Saturday that much stiffer sanctions would have to be imposed on Tehran if world powers hoped to curtail Iran's nuclear program. Thousands supporters of the French-based National Council of Resistance of Iran (NCRI) filled a makeshift stadium just north of Paris to denounce Iranian President Mahmoud Ahmadinejad and demand more pressure be brought to bear on Tehran. John Bolton, a former US ambassador to the United Nations, and former Spanish Prime Ministers Jose Maria Aznar, joined more than 100 lawmakers from across Europe, the Middle East and North America to voice their opposition to Ahmadinejad. "The international community lost a very important opportunity a year ago when they did not give strong support to the freedom fighters in the Iranian streets," Aznar said, referring to protests that followed Ahmadinejad's 2009 election. "And now we continue to approve sanctions that I consider are not enough." he told Reuters. The UN Security Council voted earlier this month for a fourth round of sanctions aimed at curbing Iran's nuclear. Bolton said the UN move was not aggressive enough. "I don't think sanctions will prevent this regime from obtaining nuclear weapons," he told Reuters. A NCRI spokesman said some 1,000 buses had ferried its supporters to the rally, adding that "many tens of thousands" had shown up. There was no independent estimate of crowd numbers. The NCRI has followers across Europe and the United States and was the first group to expose Iran's covert nuclear program in 2002. It claims to have huge backing within Iran although analysts say its support is very hard to gauge. 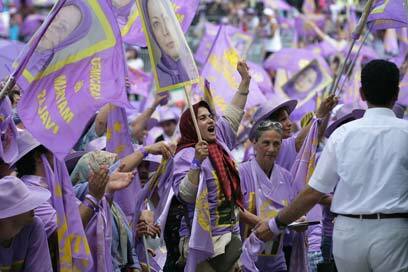 NCRI leader Maryam Rajavi told the rally that to change ideas in Tehran, the world had to get rid of the current rulers. "From our point of view, the new Security Council resolution and complementary sanctions by the US and Europe are necessary, but insufficient ... We demand that you stop the purchase of oil and gas from this regime right now," she said. "The Iranian people, of course, demand far more than this. They demand that this regime must go," she added. See all talkbacks "Iranian exiles demand tougher sanctions"